A strong interfacial chemical interaction between the NiSe2 nanocrystal and Ti3C2Tx MXene nanosheet (NiSe2/Ti3C2Tx) was established by wrapping NiSe2 octahedral crystal with ultrathin Ti3C2Tx MXene nanosheet. NiSe2/Ti3C2Tx hybrid exhibits excellent performance and cycling stability both in supercapacitor and hydrogen evolution reaction. NiSe2 nanocrystals are stabilized by the covering of Ti3C2Tx MXene nanosheet which served as a protective layer from its oxidation. Metal selenides, such as NiSe2, have exhibited great potentials as multifunctional materials for energy storage and conversation. However, the utilization of pure NiSe2 as electrode materials is limited by its poor cycling stability, low electrical conductivity, and insufficient electrochemically active sites. To remedy these defects, herein, a novel NiSe2/Ti3C2Tx hybrid with strong interfacial interaction and electrical properties is fabricated, by wrapping NiSe2 octahedral crystal with ultrathin Ti3C2Tx MXene nanosheet. The NiSe2/Ti3C2Tx hybrid exhibits excellent electrochemical performance, with a high specific capacitance of 531.2 F g−1 at 1 A g−1 for supercapacitor, low overpotential of 200 mV at 10 mA g−1, and small Tafel slope of 37.7 mV dec−1 for hydrogen evolution reaction (HER). Furthermore, greater cycling stabilities for NiSe2/Ti3C2Tx hybrid in both supercapacitor and HER have also been achieved. These significant improvements compared with unmodified NiSe2 should be owing to the strong interfacial interaction between NiSe2 octahedral crystal and Ti3C2Tx MXene, which provides enhanced conductivity, fast charge transfer as well as abundant active sites, and highlight the promising potentials in combinations of MXene with metal selenides for multifunctional applications such as energy storage and conversion. Hanmei Jiang and Zegao Wang have contributed equally to this work. The online version of this article ( https://doi.org/10.1007/s40820-019-0261-5) contains supplementary material, which is available to authorized users. With the development of society, the energy crisis has become more and more prominent; thus, developing strategies toward high efficient energy storage and energy conversion has caught much attention [1, 2]. Owing to its high power density, long cycling life, and rapid charge–discharge rates, supercapacitors (SCs) have stand out as one of the most promising candidates for energy storage . Hydrogen, as a clean and renewable energy, is considered as a promising candidate to overcome the environmental issues. Recently, the hydrogen generation through hydrogen evolution reaction (HER) is considered as one most cost-optimal energy conversion technique . Nevertheless, to date, the state-of-the-art materials for electrochemical processes in energy storage or conversion, such as the SCs or HER, are still mostly based on noble metal-based materials [5, 6]. The rare storage and high cost of these materials severely restrict their practical applications. Therefore, non-noble metal-based materials with high capacitance and low activation energy for energy storage and renewable energy are profoundly needed to replace noble metal materials [7, 8, 9]. Moreover, developing a material with both energy storage and conversion could not only save the cost but also facilitate its integration. Recently, it has been reported that transitional metal oxides , hydroxides  and their hybrids [12, 13] have been widely investigated demonstrating their potential application in both energy storage and conversion. However, the low electronic conductivity and poor cycling stability still limit their application . By contrast, transition metal selenides, with their high electrochemical activity as well as excellent thermal stability, might be a possible substitute for noble metal materials [15, 16, 17, 18]. In particular, nickel selenides (NiSe2) not only have exhibited considerable potential in lithium-ion batteries [19, 20, 21], SCs [22, 23, 24, 25], electrocatalyst [26, 27, 28] and photovoltaic , but also provided efficient HER function as the electrode materials . Previous research suggested that the good electrochemical activity of nickel selenides should be owing to the unique electronic structure and multiple oxidation states. However, pure NiSe2 exhibits unsatisfying cycling stability, low electrical conductivity, and insufficient electrochemically active sites . Therefore, hybriding with new materials is considered as the promising method to overcome the drawback. Carbonaceous materials such as carbon nanowires  and reduced graphene oxide (rGO) [33, 34] are considered favorable hybridizers for enhancing the conductivity, yet their intrinsic nature usually limits the capacities for energy storage [35, 36]. Therefore, developing new conductivity materials beyond carbonaceous materials for future energy storage and producing renewable energy poses a major challenge. As recently reported, MXene, a new family of two-dimensional (2D) transitions, metal carbides, carbonitrides with the general formula of Mn+1XnTx (M is an early transition metal, X is C/N, and Tx is surface terminal groups such as hydroxyl (–OH) and fluorine (–F), etc.) have been introduced [37, 38]. In possession of the metallic conductivity with hydrophilic nature, which is seldom realized by many other 2D materials such as layered metal sulfides and graphene [39, 40, 41], MXenes have exhibit promising potential in lithium batteries and supercapacitors when hybridized as supporting materials [42, 43, 44, 45]. For producing renewable energy, MXene with C3N4, Co-BDC MOF or MoS2 also displays superb electrocatalytic activity [46, 47, 48]. Nevertheless, MXene hybrid systems are rarely investigated. To our best of knowledge, their combinations with metal selenides have not yet been reported. 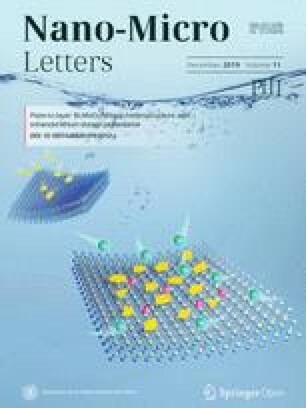 In this work, a novel electrode material based on NiSe2 octahedral crystal wrapped with ultrathin Ti3C2Tx MXene nanosheet was prepared via a simple one-pot hydrothermal route, where the hybridized NiSe2/Ti3C2Tx exhibits unique multifunction property in energy storage and conversion. The results show that the hybridized NiSe2/Ti3C2Tx displays excellent performances with capacity of 531.2 F g−1 at 1 A g−1 for supercapacitors, which is among the highest performances of the modified metal selenides [49, 50], and it also exhibits relatively smaller Tafel slope of 37.7 mV dec−1 for HER, which is close to the value of Pt. Further investigations have reviewed that these high performances of NiSe2/Ti3C2Tx are owing to the unique structure of the hybrid in which the Ti3C2Tx MXene is evenly wrapped on the surface of the NiSe2 octahedral crystal via an interfacial interaction. Compared with pure NiSe2, such connection between the two compositions not only provides much faster charge transfer, but also increases durability as well. Ti3AlC2 (98%) was purchased from the Forsman Scientific Co., Ltd. (Beijing, China). Polyvinylidene fluoride (≥ 99.5%) was purchased from Micxy Chemical Co., Ltd. (Chengdu, China). Nickel form (110 mesh per inch) was purchased from Chuan Dong Chemical Co., Ltd. (Chongqing, China). Carbon black was purchased from Cabot Corporation (Boston, USA). Hydrochloric acid (HCl, ACS grade, 36-38%), lithium fluoride (LiF, ACS grade, ≥ 99%), n-methyl-2-pyrrolidone (ACS grade, ≥ 99.8%), NiCl2 (ACS grade, ≥ 99%), Se powder (ACS grade, ≥ 99%), KOH (ACS grade, ≥ 99%), and EDTA-Na2 (ACS grade, ≥ 99%) were purchased from Sigma-Aldrich. All chemical materials were used as received without further purification. Ti3C2Tx nanosheets were prepared according to previous literature, by the selective etching of the Al layer of Ti3AlC2 using a mixture of concentrated HCl and LiF . Briefly, 2 g of LiF was slowly added and dissolved into 20 mL of 9 mol L−1 HCl under stirring to prepare the etching solution. Then, 2 g of Ti3AlC2 powders was carefully added to the solution over the course of 10 min to avoid overheating. The reaction mixture was heated to 40 °C for 48 h, and then the resulting solid was thoroughly washed using deionized (DI) water for more than three times until the pH value of the supernatant liquid reached 6–7 after the centrifugation. The final Ti3C2Tx powder was obtained after drying the raw materials at 60 °C under vacuum for 12 h. And then, 100 mg of Ti3C2Tx powder was added to 10 mL of water. After sonication 1 h under Ar bubbling, the Ti3C2Tx sheet solution (10 mg mL−1) was formed and stored in fridge for further using. The NiSe2/Ti3C2Tx hybrid was synthesized by a one-pot hydrothermal method [27, 51]. Briefly, 2 mmol Se powder was firstly dissolved by 5 mL KOH solution (20 mol L−1) to form a brownish red solution. Subsequently, 1 mmol NiCl2 was dissolved in 19 mL DI water and mixed with 1.6 mmol EDTA-2Na (as chelating agent) to form a blue solution. Then 1 mL Ti3C2Tx sheets solution (10 mg mL−1) was added into the blue solution and ultrasonically dispersed for 30 min and then dropwisely added into the above brownish red solution. The as-prepared solution was transferred into a 50-mL Teflon-lined autoclave and heated at 180 °C for 24 h. After the reaction finished, the precipitates were collected by centrifugation and washed with DI water for several times until the pH value of the supernatant liquid reaches 7. Finally, the NiSe2/Ti3C2Tx hybrid was obtained by vacuum drying at 60 °C for 12 h. For comparison, unmodified NiSe2 was synthesized by following the same method but without adding Ti3C2Tx nanosheets. X-ray diffraction (XRD) analyses were performed on a Rigaku D/MAX-r diffractometer with Cu Kα radiation (λ = 0.1541 nm). Raman spectra were measured using a Renishaw via Raman microscope with the excitation laser line at 514 nm. X-ray photoelectron spectra (XPS) were recorded on a Kratos Axis Ultra DLD spectrometer equipped with a monochromatic Al Kα X-ray source (75–150 W), and C 1s (284.8 eV) was used to calibrate all the XPS peaks before comparison. Scanning electron microscopy (SEM, NOVA-667) and transmission electron microscopy (TEM, Talos FEI) were used to study the morphology of the samples. High-angle annular dark-field scanning transmission electron microscopy (HAADF-STEM, Talos) was used to identify the elemental composition of the samples. Both supercapacitor and HER performance of the as-synthesized NiSe2/Ti3C2Tx hybrid were evaluated at room temperature in the three-electrode system on a CHI660E workstation. For supercapacitor measurement, to prepare the working electrode, NiSe2/Ti3C2Tx or NiSe2 powders (80 wt%), carbon black (10 wt%), and polyvinylidene fluoride (10 wt%) were dispersed in n-methyl-2-pyrrolidone, and then the resulted slurry was coated onto a piece of nickel form (1.0 × 1.0 cm2), which was dried at 120 °C under vacuum for 12 h and pressed under 10 MP for 1 min to obtain the working electrode. The mass loading of NiSe2/Ti3C2Tx on the nickel foam was about 8 mg. The Ag/AgCl electrode and platinum wire were used as the reference and counter electrodes, respectively. The electrochemical measurements were performed in 2 M KOH aqueous solution. The cyclic voltammetry (CV) was carried out in the potential range of − 0.2 to 0.55 V versus Ag/AgCl electrode at a scan rate from 10 to 100 mV s−1. The galvanostatic charge–discharge (GCD) was also performed in the potential range of − 0.2 to 0.55 V versus Ag/AgCl electrode. The electrochemical impedance spectroscopy (EIS) was performed in the range of 10 mHz to 100 kHz with potential amplitude of 10 mV. The specific capacitance in the three-electrode system was calculated from the GCD according to Eq. 1 .
where Cs (F g−1) is the specific capacitance, I (A) is the discharge current, \(\Delta t\) (s) is the discharge time, m (g) is the total active material mass on the electrode, and \(\Delta V\) (V) is potential window during the discharge process. For electrocatalytic reaction, 6 mg of active material (NiSe2/Ti3C2Tx hybrid, NiSe2, Ti3C2Tx) and 15 μL of Nafion solution were added into 160 μL mixed solvent of deionized water and isopropanol with a volume ratio of 5:3. The dispersive process lasted for 1 h by sonication to form a homogeneous ink. Then, 1.5 μL of the ink was loaded onto a 3-mm-diameter glassy carbon electrode. The whole electrochemical measurement process was in 0.5 M H2SO4 electrolyte, using a graphite as counter electrode, an Ag/AgCl electrode as reference electrode, and the above glassy carbon containing catalyst film as the working electrode. All measured potentials versus Ag/AgCl were transferred to reversible hydrogen electrode (RHE) based on the Nernst equation: E(RHE) = E(Ag/AgCl) + 0.0592 pH + 0.197. The linear scan voltammogram (LSV) curves were obtained by sweeping potential from 0 to − 0.7 V versus Ag/AgCl with a scan rate of 5 mV s−1. EIS was carried out under the similar parameter settings as supercapacitor. The electrical double-layer capacitance (Cdl) of as-prepared electrodes was obtained using cyclic voltammograms (CVs) in a non-faradaic potential range (0.4 to 0.5 V vs. RHE). The stability test was measured by the continuous CV with scan rate of 100 mV s−1 for 2000 times. After cycling, the polarization curve was measured again. The chronoamperometry current density–time curve was measured in a constant potential of − 0.25 V versus RHE. The brief synthetic procedure of Ti3C2Tx caped NiSe2 hybrid is shown in Scheme 1. The Ti3C2Tx MXene nanosheets (Figs. S1 and S2) were mixed within NiCl2/EDTA and Se/KOH solution, in which Ni(II) coordinated with EDTA first and formed a chelate complex, and thus could make a low concentration of free Ni(II) in the solution, which can prevent the deposition of NiSeO3 before the formation of selenides . And then, the Ni(II) chelate complex could be adsorbed on the surface of Ti3C2Tx nanosheet due to the negatively charged terminal groups (–O or –OH). 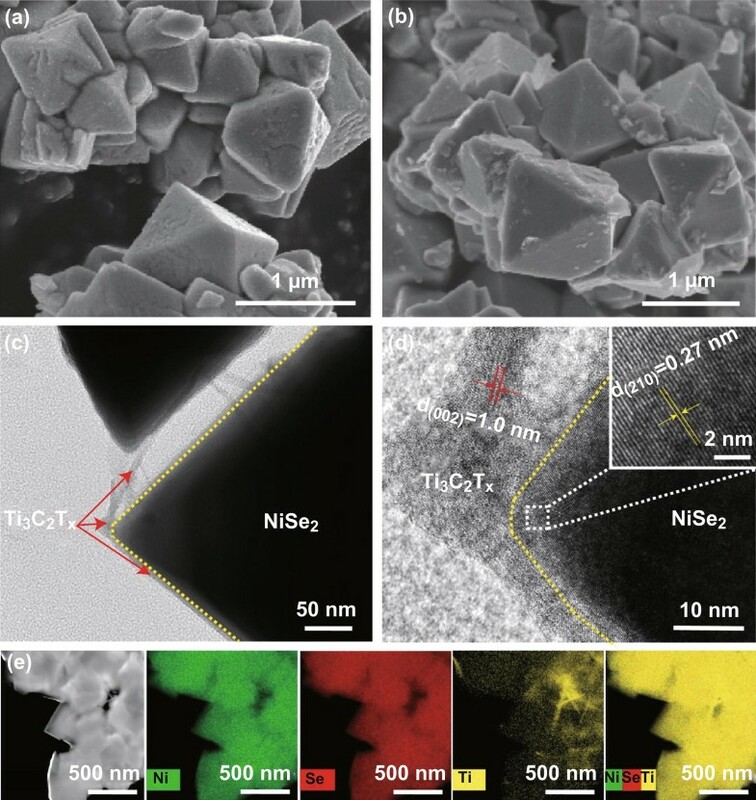 During the hydrothermal process, the electrostatic attraction between Ti3C2Tx and Ni(II) chelate complex ensures the Ti3C2Tx nanosheets wrapping on the surface of NiSe2 crystal, which results in the close contact between Ti3C2Tx and NiSe2, and thus could enhance the electrochemical performance of hybrid for both energy storage and conversion . The morphology of the as-prepared NiSe2 and NiSe2/Ti3C2Tx was characterized by SEM and TEM analyses. As shown in Fig. 1a, b, both unmodified NiSe2 and NiSe2/Ti3C2Tx exhibited a typical octahedral configuration under SEM, with the average sizes around 1 μm. However, the surface of the NiSe2/Ti3C2Tx crystal seemed relatively more glazing. Further analysis by TEM revealed that this phenomenon is possibly owing to the ultrathin layer of Ti3C2Tx nanosheet evenly covered on the surface of the octahedron-shaped NiSe2 particle (Fig. 1c), which might provide an additional electrical transport path for charge storage or electrocatalysis . Moreover, the high-resolution TEM image in Fig. 1d demonstrates the single crystalline nature of the hybrid. The lattice fringe exhibits an interplanar distance of 0.27 nm, which is in accordance with the spacing of the (210) plane of in NiSe2 single crystal . In addition, the lattice distance of 1.0 nm can be ascribed to the (002) facets of Ti3C2Tx nanosheet [38, 41]. It also need to be noted that there is transition phase between Ti3C2Tx nanosheet and NiSe2 single crystal, which cannot be well defined. Meanwhile, HAADF-STEM image and the corresponding EDX elemental mapping (Fig. 1e) show that distributions of Ni and Se in NiSe2/Ti3C2Tx hybrid were mostly homogeneous, whereas Ti exhibited the same distribution scale with less density. This also indicates that Ti3C2Tx nanosheet should be just evenly wrapped over the surface of NiSe2 crystal. In a word, these results confirmed that the hetero-nanostructure of NiSe2/Ti3C2Tx hybrid is comprised with crystallized NiSe2 octahedral crystal in the ultrathin Ti3C2Tx nanosheet cloak. As a conductive layer, the extra Ti3C2Tx nanosheet on the surface might be beneficial to strengthen the conductivity as well as the electrochemical activity of the original NiSe2 [7, 34]. The as-prepared NiSe2 and NiSe2/Ti3C2Tx samples were also investigated by XRD. As shown in Fig. 2a, the diffraction peaks of both materials at 29.9° (200), 33.6° (210), 36.9° (211), 42.9° (220), 50.7° (311), 53.2° (222), 55.5° (023), 57.8° (321), 62.2° (400), 72.6° (421), and 74.6° (332) are in well agreement with the pyrite NiSe2 (JCPDS NO. 88-1711), which echoes well with the results from high-resolution TEM, indicating the pyrite crystallized structure for NiSe2/Ti3C2Tx hybrid [20, 26]. Notably, the diffraction peak at 6.7° (002), corresponding to c lattice parameter of Ti3C2Tx sheet, was not observed in the XRD pattern of NiSe2/Ti3C2Tx hybrid, which is possibly because of the low content of Ti3C2Tx sheet in the hybrid . Despite that, no obvious impurities were detected, indicating high purity and crystallinity for both crystals. To further understand the interaction between Ti3C2Tx nanosheet and NiSe2 crystal in the composite, the Raman spectroscopy was employed. As displayed in Fig. 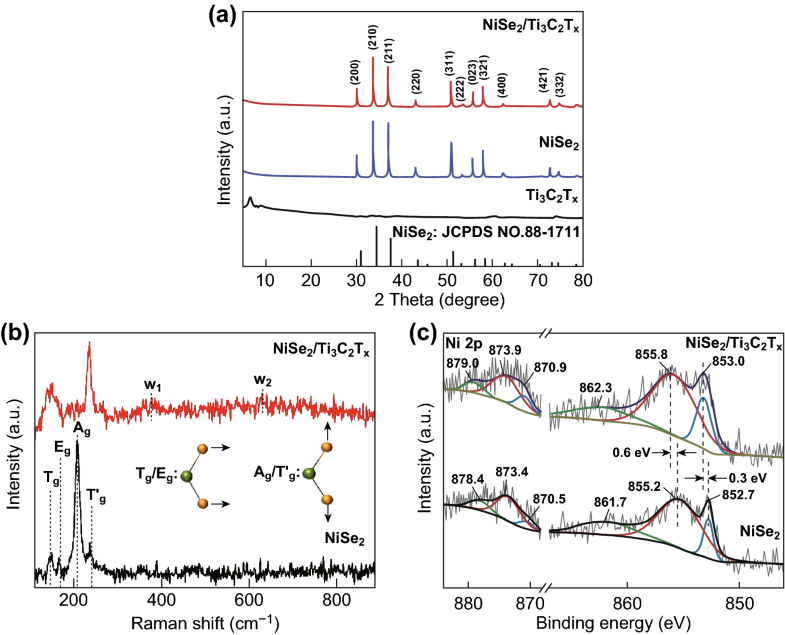 2b, for NiSe2/Ti3C2Tx hybrid, the four strong peaks (Tg, Eg, Ag, and Tg) at 149, 169, 210, and 240 cm−1 are in accordance with the Raman bands of pyrite NiSe2, which assigned to stretching and rotational modes of the Se–Se pairs in NiSe2 molecular, while the two weak peaks (w1 and w2) at 380 and 650 cm−1 are correlated with the Ti–C vibrations of Ti3C2Tx [30, 38]. Compared with the unmodified NiSe2, these four peaks of NiSe2/Ti3C2Tx hybrid obviously red-shift from the original coordinates of 154, 193, 237, and 269 cm−1, which is probably owing to the changing in the surface strain after the coating of Ti3C2Tx nanosheet, and also is indicative of a possible strong interfacial interaction between the NiSe2 and Ti3C2Tx in hybrid . XPS was carried out to verify the interfacial interaction between NiSe2 and Ti3C2Tx (see Fig. S3 for the survey spectra). The Ni 2p spectrum has been fitted by considering two resolved doublets with a spin–orbit splitting around 18.0 eV between 2p3/2 and 2p1/2 and a fixed area ratio equal to 2:1 (Table S1). As shown in Fig. 2c, the Ni 2p spectrum of NiSe2/Ti3C2Tx hybrid exhibits peaks at binding energy of 853.0 and 870.9 eV, corresponding to the Ni 2p3/2 and Ni 2p1/2, respectively. The peaks at 855.8 and 873.9 eV are related to the oxidation state of Ni on the surface. Two satellite peaks at 862.3 and 879.0 eV were also observed [27, 55]. Compared with unmodified NiSe2, the characteristic peaks of Ni species from NiSe2/Ti3C2Tx hybrid are obviously shifted by 0.3 and 0.6 eV to higher binding energy. This obvious Ni 2p peak-shift toward higher binding energy confirms the strong interactions between NiSe2 and Ti3C2Tx, which makes the Ni center in NiSe2 more positively charged and thus facilitates the electrostatic attraction of more anionic intermediates for fast redox process [56, 57]. This finding is in decent agreement with the Raman results and may be due to the Ti3C2Tx containing rich hydroxyl terminations with high electronegativity, which can strongly interact with NiSe2 . Compared with traditional physical binding (Fig. S4), such binding method might be more efficient for redox process and charge transfer in NiSe2/Ti3C2Tx hybrid, consequently accelerating its electrochemical activities [7, 45]. Meanwhile, the paired redox peaks (see Fig. S5 for details) still existed with the increasing scan rate which indicates good ability of rapid oxidation reduction reaction for NiSe2 . However, with the increase in the scan rate, an asymmetry of redox peaks was detected, which may be due to the polarization effect as well as ohmic resistance during the Faradic process [59, 60]. In addition, the symmetrical time of charge and discharge in all cases (see Fig. S6 for details) indicates high coulombic efficiencies of as-prepared electrodes and in good agreement with the CV curves. In particular, NiSe2/Ti3C2Tx hybrid exhibits much larger CV area and longer charge–discharge time (Fig. 3b) compared with the unmodified NiSe2, verifying the higher supercapacitor performance. From the Galvanostatic charging/discharging curves (GCD) curves, the highest specific capacitance of NiSe2/Ti3C2Tx was estimated to be 531.2 F g−1 at 1 A g−1, which is 31% larger than that of the unmodified NiSe2 at same current densities. Moreover, a specific capacitance of 348 F g−1 for NiSe2/Ti3C2Tx hybrid could still be achieved at a higher current density of 10 A g−1, exhibiting a relatively good rate capability with the retained capacitance of 66%, which is 8% larger than that of the unmodified NiSe2. This considerably enhanced electrochemical performance and improved rate capability of the NiSe2/Ti3C2Tx hybrid which might be caused by the interfacial effect from the interfacial interaction of Ti3C2Tx, which improves the electrochemical activities of the materials. To further investigate the inner electrochemical mechanism of the performance facilitating process, the EIS was carried out for both NiSe2/Ti3C2Tx hybrid and unmodified NiSe2. As shown in Fig. 3d, the Nyquist plots for both materials exhibit the similar pattern with two semicircles in the high-frequency region and a linear line in the low frequency area. The first and second semicircles are related to the charge-transfer process and electrolyte infiltration process on the surface, respectively, whereas the linear part is related to finite Nernst diffusion in the surface and semi-infinite Warburg diffusion process in the bulk . In Fig. 3d, a simulated equivalent circuit is introduced to fit the Nyquist plots, where the Rs means solution resistance; CPE1 and CPE2 are constant phase element; Rct represents the charge-transfer resistance; Ws and Wo are the finite Nernst diffusion impedance and semi-infinite Warburg diffusion impedance, respectively . The detailed fitting parameters are included in Table S2. The results manifest a charge-transfer resistance of 95.4 mΩ for NiSe2/Ti3C2Tx hybrid, which is obviously lower than that of unmodified NiSe2 (127.4 mΩ). This reduced charge-transfer resistance for NiSe2/Ti3C2Tx hybrid should be attributed to the enhanced conductivity from the chemical combination of high conductive Ti3C2Tx sheet. Meanwhile, the Warburg diffusion resistance of the NiSe2/Ti3C2Tx hybrid is 31.6% smaller than that of unmodified NiSe2, indicating a higher ion diffusion rate. The low diffusion resistance of ion transport should be owing to the two-dimensional morphology and the extra redox active sites from terminal group on the Ti3C2Tx sheet surface [40, 44]. In sum, the EIS spectrum analysis demonstrates that the introduction of Ti3C2Tx provides lowered charge-transfer resistance as well as enhanced ion diffusion rate, therefore facilitating a higher specific capacitance for NiSe2/Ti3C2Tx hybrid . In addition, the long-term stability of the two samples also has been tested via the GCD method at 4 A g−1 (Fig. S7). It showed that the capacitance retention of NiSe2/Ti3C2Tx hybrid is 47.3% larger than that of unmodified NiSe2 after 1000 cycles, suggesting that the Ti3C2Tx sheet can also improve the stability of NiSe2 during electrochemical process. This stabilization effect might be attributed to two aspects. Firstly, since the NiSe2 is known to form irreversible oxide counterparts in the electrochemical cycling, the Ti3C2Tx sheet can serve as a protective layer from its oxidation [20, 31]. Secondly, similar to the modification on rGO and other 2D carbonaceous materials [61, 62], the interfacial interaction of Ti3C2Tx sheet should favor the defective sites on NiSe2 particle surface, which, to a large extent, amends the deficiency of the original NiSe2 nanocrystal. However, these deductions still need further verification in the future. To estimate its potential multifunction, NiSe2/Ti3C2Tx hybrid was employed as the catalytic materials in hydrogen evolution reaction, where the catalytic materials would decrease the reaction barrier. For comparison, HER activity measurements were also performed for the pure Ti3C2Tx, unmodified NiSe2, 20%Pt/C, and glassy carbon under the same conditions. From LSV curves in Fig. 4a, as expected, the 20% Pt/C displays remarkable HER activity (10 mA cm−2 at 44 mV vs. RHE), while pure Ti3C2Tx and glassy carbon display no obvious catalytic activity for H2 evolution. In contrasted, the NiSe2/Ti3C2Tx exhibits an enormous increase in the cathodic current density compared with the NiSe2 and the Ti3C2Tx, exhibiting an overpotential of 200.0 mV at a current density of 10 mA cm−2, which is lower than unmodified NiSe2 of 239.0 mV under the same current density. Moreover, the overpotential required for the NiSe2/Ti3C2Tx hybrid and unmodified NiSe2 to produce a current density of 45 mA cm−2 is 269.0 and 418.1 mV, respectively. It is obvious that the NiSe2/Ti3C2Tx hybrid possesses a better HER catalytic activity than unmodified NiSe2. The enhanced performance of the NiSe2/Ti3C2Tx electrode can be attributed to the charge transfer from NiSe2 to Ti3C2Tx, which may provide a faster adsorption kinetics and higher utilization of active sites for high HER efficiency . In order to demonstrate the kinetics of the electrodes during the HER process, the Tafel analysis was carried out on the polarization curve. As shown in Fig. 4b, the NiSe2/Ti3C2Tx hybrid with low Tafel slope of 37.7 mV dec−1 is nearly comparable to that of Pt catalyst (30.5 mV dec−1) and smaller than that of the unmodified NiSe2 (46.9 mV dec−1) as well as unmodified Ti3C2Tx (222.2 mV dec−1), which implies that the electrocatalytic reaction follows the Volmer–Heyrovsky pathway for the NiSe2/Ti3C2Tx hybrid . In addition, the exchange current density (j0) at the thermodynamic redox potential (η = 0), another key factor to evaluate catalytic property, can be extracted by extrapolating the Tafel plots to the x-axis . The j0 value (147.5 μA cm−2) for the NiSe2/Ti3C2Tx hybrid is higher than that of the unmodified NiSe2 (56.8 μA cm−2), indicating a better catalytic activity of the NiSe2/Ti3C2Tx hybrid (Table S3). 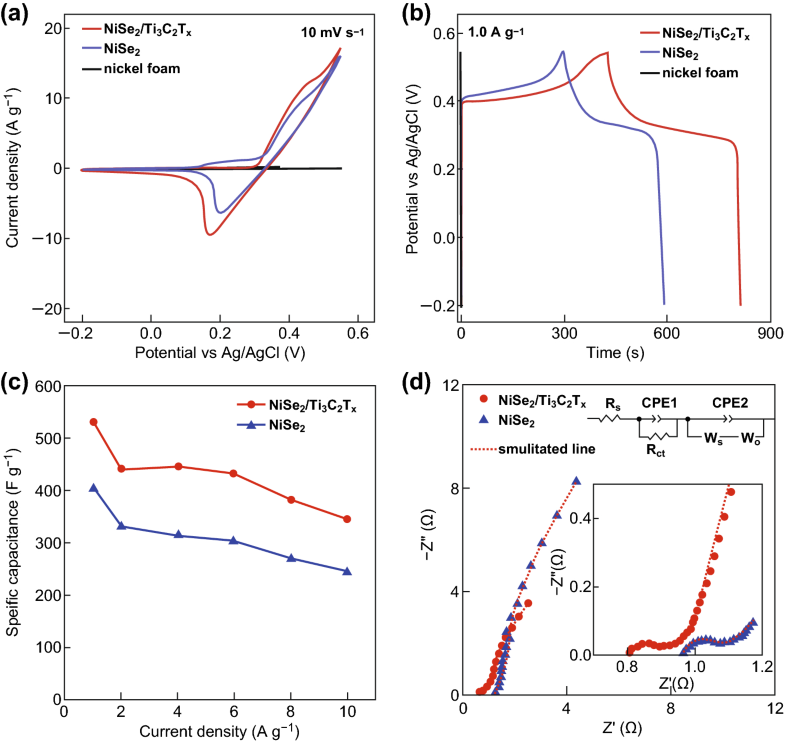 These results clearly demonstrate an enhanced catalytic performance of NiSe2/Ti3C2Tx hybrid, which is possibly owing to the interfacial interaction between the Ti3C2Tx sheet and NiSe2 crystal, inducing the charge-transfer process. As shown in Figs. 4c and S8, the double-layer capacitance Cdl for NiSe2/Ti3C2Tx hybrid (203.1 μF cm−2) also exhibits large improvement compared with unmodified NiSe2 (114.2 μF cm−2), which suggests that the Ti3C2Tx sheet wrapping on NiSe2 surface not only facilitates changer transfer, but also improves the utilization of active site as well . The EIS measurements in 0.5 M H2SO4 electrolyte provide further details on the enhanced HER process. As shown in Fig. 4d, the Nyquist plots are fitted by equivalent circuit model (Fig. S9) , and the simulated parameters are summarized in Table S2. The NiSe2/Ti3C2Tx hybrid exhibits the lower Rct (33.9 Ω) than that of unmodified NiSe2 (95.7 Ω), indicating a higher electrochemical reaction rate and more efficient charge-transfer process for hybrid . This enhanced conductivity could result from the chemical coupling with Ti3C2Tx sheet, a better conductor. Consequently, the high conductivity of the NiSe2/Ti3C2Tx hybrid guarantees the higher apparent catalytic activity toward HER since less potential is needed for driving the current transport across the catalyst . In addition, the long-term stability test revealed a superior durability of the NiSe2/Ti3C2Tx hybrid (Fig. S10), where the NiSe2/Ti3C2Tx hybrid showed negligible degradation in the current density after 2000 cycles, which is also positively related to the combination of Ti3C2Tx sheet . 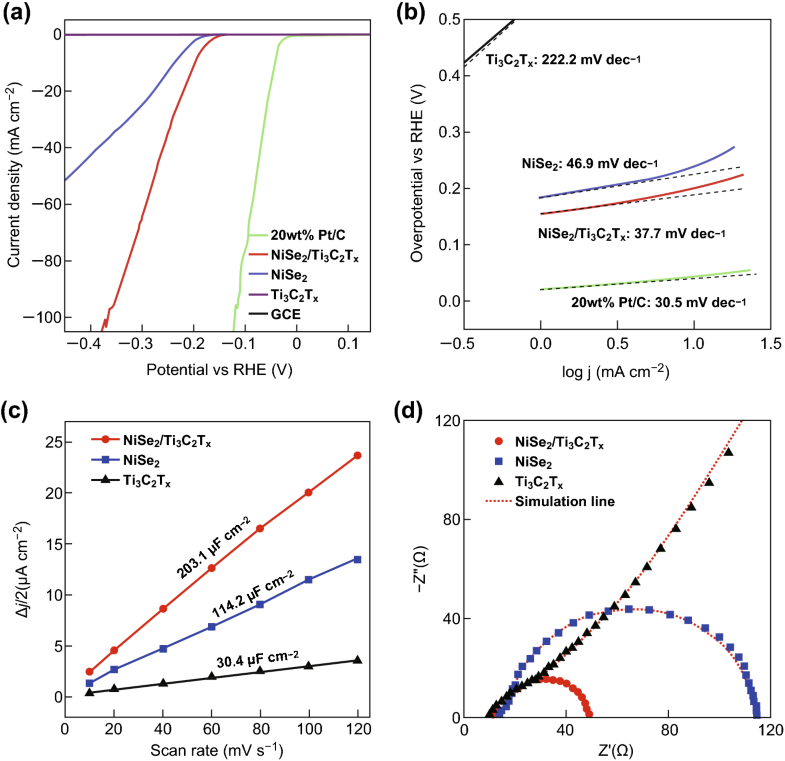 To demonstrate further the good stability, time-dependent current density curve for NiSe2/Ti3C2Tx under constant overpotential of − 0.25 V versus RHE was also conducted for 10 h. As shown in Fig. S11, the current density of the NiSe2/Ti3C2Tx hybrid has slight decrease compared with pure NiSe2. In general, certain requirements such as good electrical conductivity, robust structure, large active surface area, and fast diffusion pathway, are applicable to achieve high-performance materials for energy storage and electrocatalysis . The unique structural superiorities make NiSe2/Ti3C2Tx hybrid a well-fit candidate for these demands. Firstly, the NiSe2 are stabilized by Ti3C2Tx MXene sheet wrapping on the surface, and their outstanding electrical properties are secured. Moreover, the Ti3C2Tx MXene sheet significantly promotes the electronic coupling by acting as the 2D conductive linker for fast charge transfer. Finally, the functional terminal group on Ti3C2Tx MXene surface provides the possibility for chemical coupling with NiSe2 crystal, which enables the strong interfacial interaction for fast charge transfer and high stability against repeated electrochemical cycling as well. 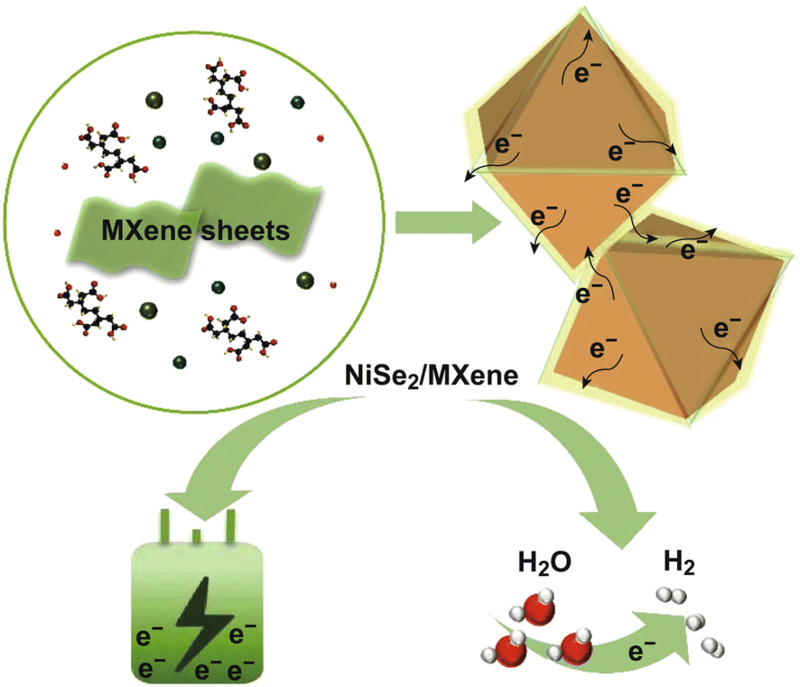 These advantages for the synergism of NiSe2 crystal and Ti3C2Tx MXene sheet have led to a remarkable improvement in electrochemical activity and durability for supercapacitor and HER. Furthermore, compared with recently reported supercapacitor materials and HER catalysts (Table S4 and Table S5, respectively), the NiSe2/Ti3C2Tx hybrid has shown superior performance, verifying an enormous potential in multifunctional applications. In summary, a novel NiSe2/Ti3C2Tx hybrid has been successfully synthesized, by wrapping NiSe2 octahedral crystal with ultrathin Ti3C2Tx MXene nanosheet via a one-pot hydrothermal method. Its composition and morphology have been analyzed through varies techniques, establishing a strong interfacial interaction between NiSe2 octahedral crystal and the evenly distributed ultrathin Ti3C2Tx MXene nanosheet layer on its surface. A high specific capacitance of 531.2 F g−1 at 1 A g−1 for supercapacitor, low overpotential of 200 mV at 10 mA g−1, and small Tafel slope of 37.7 mV dec−1 for HER are achieved by employing NiSe2/Ti3C2Tx hybrid as the electrode material. Furthermore, greater cycling stabilities for NiSe2/Ti3C2Tx hybrid in both supercapacitor and HER have also been achieved. These significant improvements compared with unmodified NiSe2 should be owing to the strong interfacial interaction between NiSe2 octahedral crystal and Ti3C2Tx MXene which provides enhanced conductivity, faster charge transfer as well as more abundant active sites and also highlight the promising potentials in combinations of MXene with metal selenides for multifunctional applications such as energy storage and conversion. This research was supported by Grants from the Danish National Research Foundation, AUFF-NOVA project from Aarhus Universitets Forsknings fund, EU H2020RISE 2016-MNR4SCell project, National Natural Science Foundation of China (Nos. 21528501, 51272296, and 51571195), and the Chongqing Graduate Student Research Innovation Project (No. CYB15046). We also gratefully acknowledge support from the Key Program of the Chinese Academy of Sciences (KJZD-EW-M05-3). H. Jiang greatly appreciates the financial support of China Scholarship Council (CSC). Z. Wang thanks the support of Fundamental Research Funds for the Central Universities, China (YJ201893).